A unique stand-alone Gateway location into Times Square at the north end of the “bow tie”. • Full-motion, high resolution video with total flexibility in terms of the length of spot and schedule. • Provides over 10+ blocks of unobstructed visibility down 7th Avenue from as far north as Central Park. • With Broadway closed to vehicular traffic at 47th Street, the congestion on 7th Avenue results in significant dwell times. • The proximity to the main tour bus staging area offers a unique exposure to the tourists as they “take it all in”. • Entrances to the 49th Street subway stop surround the base of the Triple Play. • Nearly 3,800 square feet of LED displays using three synchronous signs. 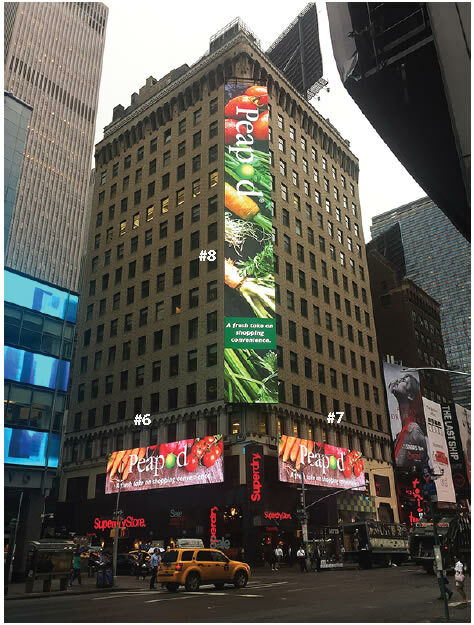 • The highest resolution outdoor signs in Times Square.